Season’s Greetings and Happy Unique Solstice December 21, 2013 ! I loved everything about doing the cards this year! 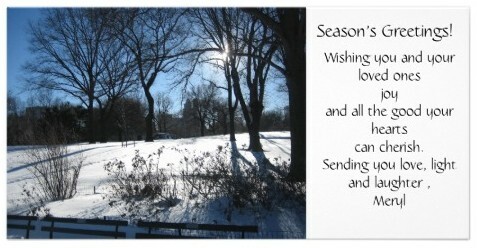 Once again I took this picture in Central Park after our monumental blizzard in November, 2011. There was no question that this was the one for this year. I put my heart into writing the cards. Time flew and they were done. It’s amazing how gratitude and love can energize every task! I wish each and every one of you , dear readers, a most joyous holiday season and that 2014 is our very best ever! I also thought it was important to include this message from Patricia Cota-Robles. In this reprint she gives the link to a radio interview where she not only covers information that those of you who regularly follow her messages will find familiar, but she also has brought new information about the significance of energy shifts starting December 12, 2013 that are building momentum until the solstice December 21, 2013. You won’t want to miss her information about the energy of the divine feminine being expanded during this window and how the solstice will be a major influx of light to usher in the energies of the New Earth. She also discussed the larger significance of the events celebrating the life of Nelson Mandela.